Madeleine Neave’s book is unique, describing her collection of breadboards from Victorian times, from her Antique Breadboard Museum. A book for wood carvers, antique collectors, people who visit car boot sales and antique fairs, and for people who want their own kitchen to be quirky and love original kitchenalia. Also a great book for bakers and people who wish to do intricate wood carving. Madeleine Neave has arranged the collection of breadboards, knives, butter churns and other kitchen paraphernalia which was started by her mother, Rosslyn, who was an antique restorer and collector. She runs the Antique Breadboard Museum from her home serving cream teas, and visitors are asked to choose which breadboard to have their scones and jam served on. 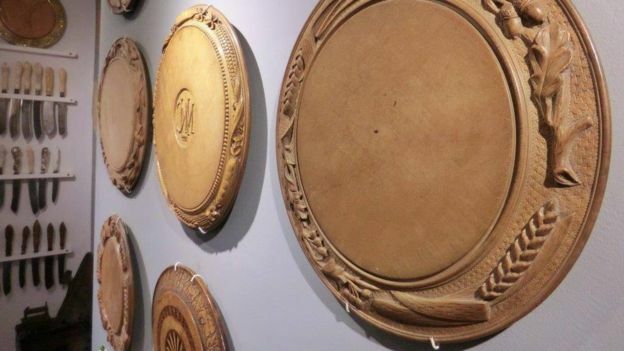 Decorative ‘bread-platters’ were hugely popular in Victorian times, firstly among the elite who commissioned custom-made items featuring their coats-of-arms and mottos. They were also used to commemorate royal ceremonies, and of course, families put their crests on them if they were upper class. By the 1860s, enterprising workshops were producing bread-platters more cheaply with standardised carving for the mass market. The production centre until the 1950s was Sheffield, with skilled turners, carvers and metalworkers collaborating to produce matching sets of tableware. In the book, Madeleine Neave shows us how beautiful and varied the boards were, with the inclusion of butter knives, butter churners, and memories from her mother, Rosslyn, who began the collection after a childhood on a farm, milking cows by hand, and making butter. Madeleine Neave welcomes people to her Antique Breadboard Museum in Putney, London, and is an expert on the history and relevance of these beautiful objects. Until recently, she taught French in secondary schools, and she lives surrounded by breadboards, with her young family, in her unique Victorian cottage in Putney. From Huon, who took the trouble to visit twice and meet our Assistant Curator, Tom Samuel. He has summarised the history rather beautifully. Thank you very much Huon. Not so enamored of the title… Sliced bread? What a notion. We are the best thing BEFORE sliced bread. Also exhibiting boards and photos at Putney Library 29 Apr-3 June. Putney Library kindly promoted our exhibition as part of this month’s City Read, The Muse, by Jesse Burton, which has a food theme tying in with our activities. Catherine Lee gives us a wry write-up! 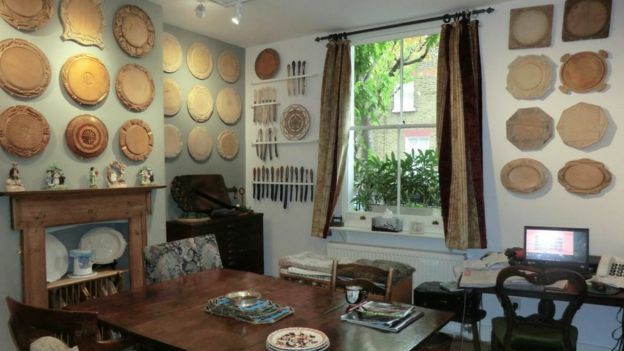 The Antique Breadboard Museum, based in the front room of founder Madeleine Neave’s house in Putney, London, claims to be the world’s first – and we suspect, only – such establishment. Rapt visitors can feast their eyes on a “stunning collection of breadboards and bread knives, butter dishes, butter knives, cheeseboards and related items dating from the 1840s”. In pride of place are several decorative and bespoke breadboards that were popular in Victorian times. Although open for less than a year, she says the museum has already attracted “bakers, craftspeople, nostalgia hunters, eco-warriors… and those wanting brownie points when troublesome mothers-in-law visit”. Because mothers-in-law just love breadboards. JP Devlin did us the honour of visiting us to find out how the museum came about. We are 48 minutes in! My thanks to Sylvia for inviting us to contribute.